As a young bride spaghetti started with a box called Kraft Spaghetti Classics. The .595 lb. box contains dried spaghetti, a seasoning packet with "specially-blended, tangy herbs and spices" and a dried parmesan cheese packet for $2.00. My chicken soup began with Soup Starter because I didn't know how to make it from scratch. My potatoes came from a box. My macaroni and cheese came from a box. My burritos came from the frozen food section at Sam's Club. My macaroni salad came from a box or a grocery store deli. The Pillsbury Doughboy offered quick crescent rolls, cinnamon rolls, biscuits. Campbell's Soups were, Mmm Mmmm Good! Huge expense, lots of chemicals, MSG, and transfats but they were quick and didn't require any planning ahead. So, why would I feed my family food out of a box? I didn't know any better! 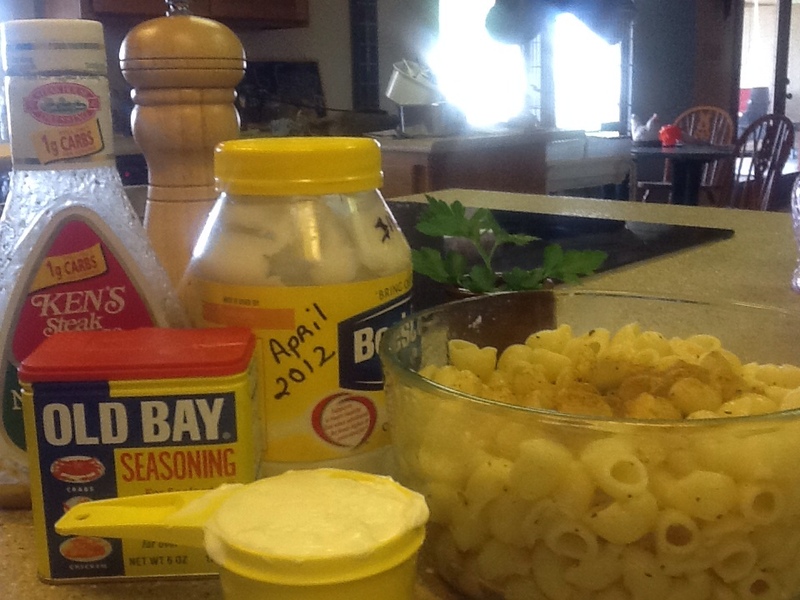 But I do now, so in defense of Homemade here's my personal recipe for Pasta Salad! 1/2 cup frozen peas (no need to cook, they will thaw in the salad) You may substitute with blanched broccoli or asparagus. To medium saucepan, add 1 tablespoon salt and bring to a boil. Add pasta and stir. Cook until aldente, see package instructions. While pasta is cooking, thaw shrimp under warm water. Peel off shells. Drain pasta in colander. In a large, 2 1/2 quart bowl combine 1/4 cup Italian dressing with pasta and toss. To same rinsed out saucepan, add 3 cups water, 1 tablespoon pickling spice, and bring to a boil. 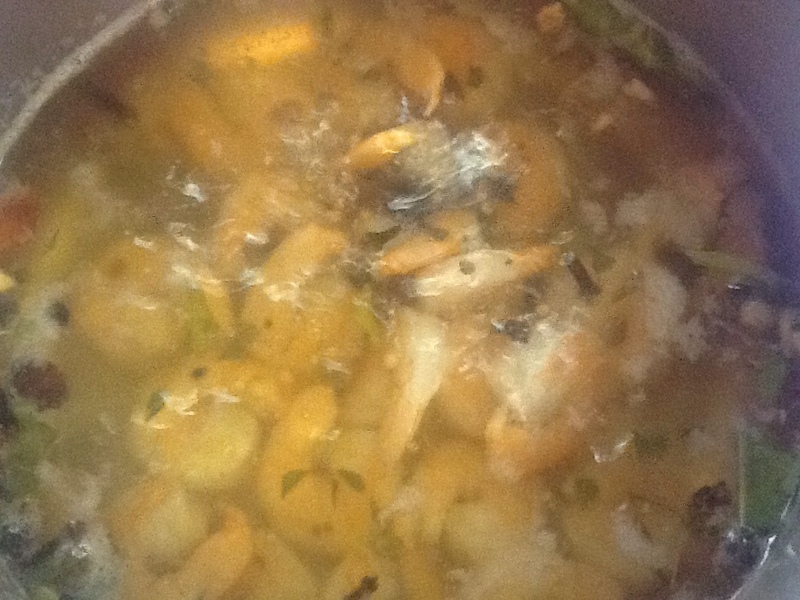 Add shrimp, bring back to a gentle boil, shrimp will turn pink when fully cooked. Drain in colander, rinsing off pickling spice. 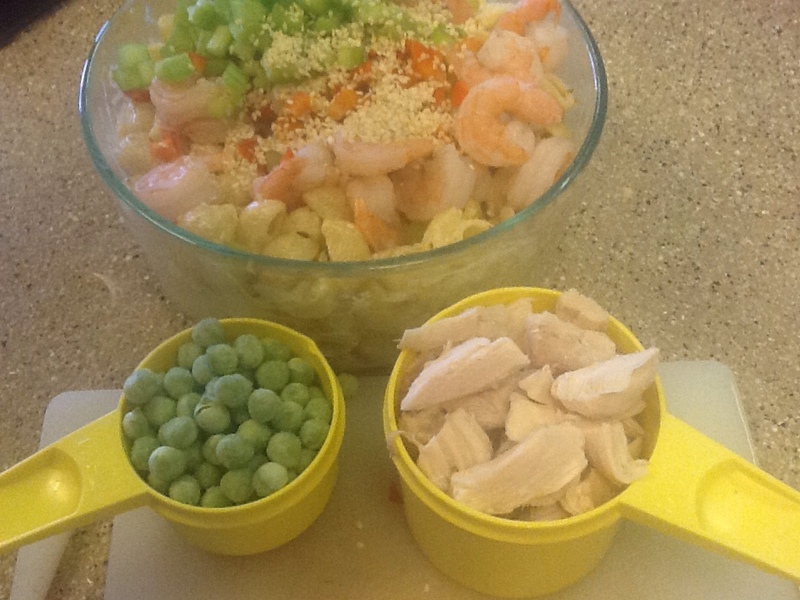 To the pasta bowl, add mayonnaise, diced peppers, celery peas, sesame seeds, Old Bay Seasoning, salt and pepper, shrimp and cubed chicken. Toss well to coat. Chill for 2 hours. Makes 4 large servings. Serve with hot muffins. Shrimp turning pink, time to remove. 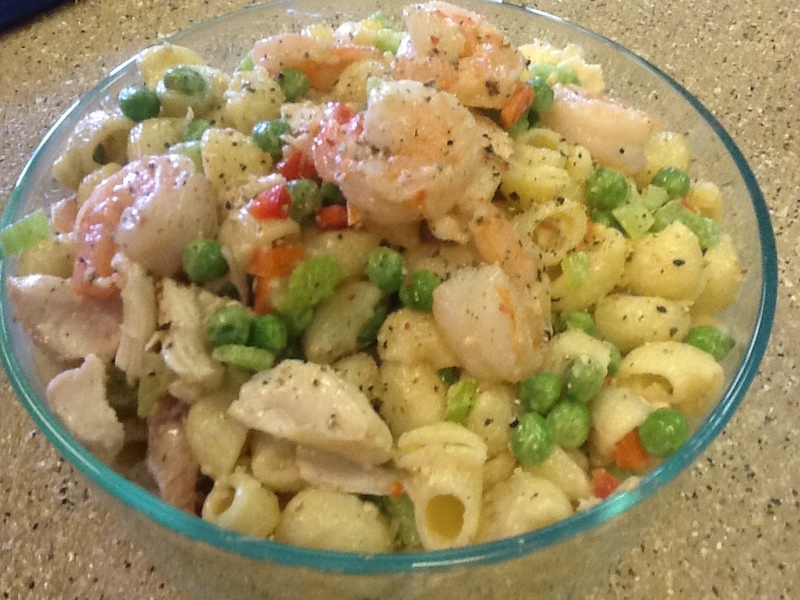 Make up a bowl of Shrimp and Chicken Pasta Salad. Cold dishes, like pasta salad, can be prepared in advance providing you with healthy "fast food" when you want it. Once you have the basic recipe down, you can add olives, cheese cubes, just chicken, just shrimp and make it your own creation! What are some of the foods you cooked or cook from the box or can? What foods would you like to learn to make from scratch? Leave your comments and I'll help you find healthier recipes for you and your family. It's all about caring for your family by providing balanced, nutritious, meals that not only look good but taste great! This is so delicious! Thank you so much for sharing this recipe!! You're welcome. You know that expression "thinking outside of the box"? That's what we have to do when it comes to eating. Boxed foods are full of preservatives, dyes, MSG, etc. it's time we know what's in our food because we made it from scratch!